An alternative to tagging is the Saved Search. Saved searches create a one-click view of a subset of your community. If you find yourself frequently looking up how many people you have in New York, or how many people gave more than 5 hours of their time to last year's gala, you can save your searches for easy reference. Use the Filter tool to create your search, and select 'Save this search'. You can find your saved searches by clicking the 'Searches' button on the Community toolbar. Click on a search title to display everyone in that search. When your search is displayed, you can export it. A saved search is like a window into your community - it gives you an easy way to view people who meet the queries of your search. 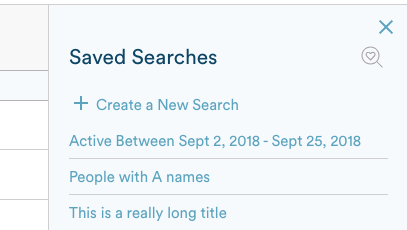 Once you view a saved search, you can 'Select all' in the Community view and send a message, make mass notes, or credit time to the group. But that's it. Searches are intended to pull lists from your community, while tags are best used to sort and organize your community.